October 29, 2009 – The 937 Condominiums is a 16-story tower in the relatively new, upscale Pearl District in downtown Portland, Ore. The condos range from $300,000 to $2.2 million. In August 2009, the 937 Condominiums project was a featured building during the region’s first urban Street of Dreams, and at the 2009 Ultimate Open House, presented by the Home Builders Association of Metropolitan Portland in April. The project may earn a platinum rating from the U.S. Green Building Council’s LEED&reg; program. “We were asked in multiple meetings to help the owner by providing green building solutions that could contribute to higher LEED certifications, and ideas to provide a better value to the owner,” said Western States Fire Protection Co. Engineer Jared Hill, P.E. Providing outside-the-box ideas at the bid interview helped Western States Fire Protection Co. secure the project contract. “We contributed multiple ideas to the process, including offering solutions such as recycling all water used for testing back into the break tank and providing information about the recycled content of the products we use,” Hill said. Routing the drain lines back to the tank may save thousands of gallons of water when the pressure-reducing hose valves are tested. According to the Northwest Examiner article “First urban Street of Dreams coming to Pearl,” the building will use about 30 percent less energy and water than similar buildings of its size. “We also put a lot of extra effort into brainstorming a hanger assembly that would minimize the ceiling space needed for our pipe while still meeting code requirements,” Hill said. 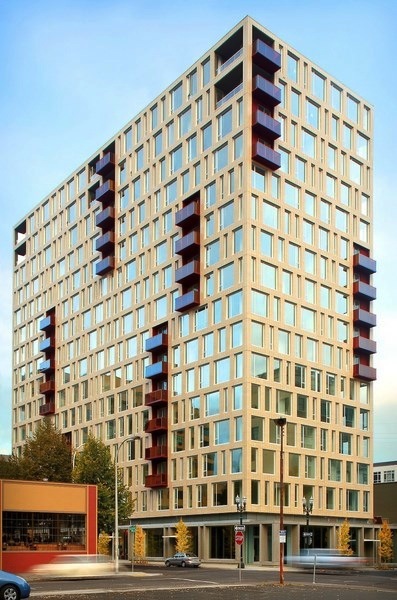 The city of Portland has strict height limits on its downtown construction, and the building remained under the maximum height while adding the extra floor, bringing in added revenue for the client. The 250,000-square-foot building has 20,000 square feet of retail space on the first floor with two levels of subterranean parking. Western States Fire Protection Co. designed and installed the garages and retail shell using steel pipe. The condominium floors were installed using Chlorinated Polyvinyl Chloride (CPVC). There are two staircases with standpipes, with the entire system being served by a fire pump in the garage. There is an on-site break tank feeding the fire pump. An automatic fill line from the city’s water supplies the break tank. The entire project was design/build and no fire protection drawings were provided. Western States Fire Protection Co. was involved in the project since its inception in August 2006. Western States Fire Protection Co. is a full-service fire protection contractor with 26 locations west of the Mississippi, including Fire Protection Services, National Fire Suppression, and Statewide Fire Protection divisions. Visit WSFP.COM to learn how we can serve you.